An allergy is the body’s overreaction to substances that do not cause a reaction in someone who is not allergic. These substances are called allergens. There are many different types of allergens including mold, animal dander, dust, certain foods, as well as pollen from trees, grass, and weeds. These allergens cause the release of histamine in susceptible individuals which leads to allergy symptoms. An allergic reaction to pollen or mold spores is a seasonal allergy. An allergy to pollen is sometimes called “hay fever.” Seasonal allergies will affect people at the time of year when certain pollens are at their highest levels. The most common times of year for seasonal allergies are in spring, summer, and fall. Seasonal allergies are a common problem in many parts of the world and New Mexico is no exception. One of the most common seasonal allergies in New Mexico is the juniper allergy. Twenty to 30 percent of the population is allergic to juniper. Junipers are coniferous plants of the cypress family. Only the male juniper plants produce allergenic pollen. The female plants are fertilized by the male plants and produce berries but not allergies. In Santa Fe, New Mexico, juniper allergy seems to affect people starting in February and can last through March and into April. Other allergies common to the Santa Fe area include allergies to mulberry or pig weed, cedar and chamisa. Allergic reactions can also trigger an asthma attack in susceptible individuals. If you think you have allergies and your symptoms are interfering with your life, consider seeing a health care provider to discuss possible allergy medication and treatments. What can be done to prevent or avoid allergies? Antihistamines help reduce sneezing, runny nose, and itching. These come in pill form as well as nasal sprays and some medications require a prescription. Decongestants, such as pseudoephedrine or phenylephrine relieve the stuffy nose of allergies. Decongestants come in pill form or as a nasal spray. Decongestant nasal sprays are available over the counter but should not be used for more than 3 days in a row as chronic use can cause rebound congestion that makes you even more congested after you stop using them. Using decongestants, particularly in pill form, can raise your blood pressure so you should ask your health care provider before using this type of medication. Nasal steroid sprays are one of the most effective treatments for seasonal allergies. They reduce the reaction in the nasal tissues to inhaled allergens. Some nasal steroids are now available over the counter. You will have to use the nasal spray for 1-2 weeks before getting the full benefit. Eye drops help improve symptoms of irritated, watery, itchy eyes. Some of these medicines are available over the counter and others require a prescription. Allergy shots (also called immunotherapy) are an option for people who try other treatments but continue to have bothersome allergy symptoms. These shots include small amounts of allergen so that your body gradually gets used to the allergen. Over time, your allergy symptoms become less severe. Complementary treatments such as acupuncture and Traditional Chinese Medicine help control some people’s allergies. They can be particularly helpful for certain symptoms of allergies such as nasal congestion and allergy headaches. If you are interested in acupuncture, come to Aspen Wellness! At Aspen Medical Center, we provide consultations for allergies as well. We can prescribe allergy medications and if necessary, we can provide allergy specialist referrals. If you are suffering from allergies, come in and see us today! Primary care is the backbone of a well-functioning, efficient healthcare system. Primary care providers (PCP’s) can be physicians, physician’s assistants, and/or nurse practitioners who treat adults and children of all ages for their general healthcare needs. Usually the primary care provider (PCP) is the first contact and principal point of continuing care for patients. The PCP also coordinates specialist care that the patient may need. Primary care results in better health outcomes, reduced health disparities and lower spending, by avoiding unnecessary emergency room visits and hospital care. PCP’s, acting as guides for your health, are an important component in ensuring that the healthcare system as a whole is sustainable. Continuity is a key characteristic of primary care, as patients usually prefer to consult the same practitioner for routine check-ups and preventive care, health education, and every time they require an initial consultation about a new health problem. It is generally recommended to follow up with your PCP at least once a year. PCP’s are like air traffic controllers who can help manage and coordinate care, especially for people with multiple complex medical problems. Therefore, it is always important to follow up with your PCP anytime there is lab work or other studies done, if/when you need medication refills, after seeing a specialist, after an illness or injury, or certainly if there is a major health event in your life such as a hospitalization or surgery. Your PCP needs to remain informed about your health status. If you do not have your own PCP, Aspen Medical Center in Santa Fe, New Mexico is still taking some new primary care patients on a limited basis. We are always available for your urgent care needs (please see the previous blog for a discussion of urgent care). At Aspen Medical Center, we are here to help you get and stay as healthy as possible. It’s time to celebrate Thanksgiving. This is not only a time when we get together with family and friends and eat lots of delicious food, but it is also a time to give thanks and be grateful. 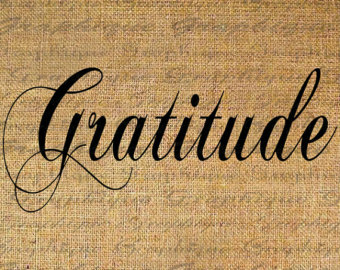 Gratitude, from the Latin gratus, meaning “pleasing or grateful,” is strongly and consistently associated with greater happiness, as well as better physical and mental health. There has actually been a great deal of research done on the effects of gratitude and the list of its benefits is almost endless. Perhaps this would be a good time to review some of the benefits of gratitude and to consider some advice on how to practice gratitude in daily life. Write a thank-you note. Help make yourself and another person happy too by writing a thank you note to someone who had a positive impact on your life. Thank someone mentally. If you are too busy to write a note, just think of someone who did something nice and thank them in your mind. Keep a gratitude journal. One way to bring more of the positive effects of gratitude into your life is to keep a gratitude journal. Write down three things that you are grateful for before you go to bed. Count your blessings. Counting blessings is something that can be done either in writing or just in your head. Listing all the good things in your life and all the ways you are fortunate can be an effective way to experience thepleasant feeling of gratitude. Pray. If you are religious, giving thanks through prayer is a way to cultivate gratitude. Meditate. Meditation is a way to practice awareness of the present moment and bring more peace and balance into one’s life. Gratitude can be an object of meditation by focusing on what you’re grateful for. Make gratitude a habit! Urgent care is medical care for an urgent problem that is not life threatening. Examples of life-threatening emergencies include a heart attack or a serious head injury. These require a visit to the Emergency Room (ER). 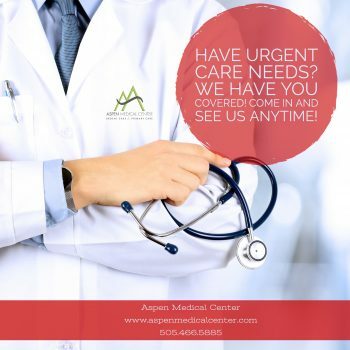 Urgent Care centers such as such as ours, Aspen Medical Center in Santa Fe and Aspen Urgent Care in Espanola, New Mexico, are setup to assist patients with an illness or injury that does not appear to be life–threatening, but also can’t wait until the next day. When faced with a medical problem that requires immediate care, it is sometimes difficult to determine if it is truly an emergency, or if it is an urgent care issue. Urgent care is not a substitute for emergency care. In general, an emergency medical condition is one that can quickly endanger the life or limb of an individual. Dial 911 without delay for any medical problem that appears to be immediately life-threatening. ER visits are necessary for true emergencies, such as chest pain that is potentially a heart attack and severe injuries. Minor injuries and illnesses can be evaluated by our urgent care providers. What conditions are appropriate to treat at an urgent care center? The average cost of an ER visit is $2,250 according to insurer Cigna. In contrast, urgent care visits average $170. If one has an urgent care need, it is reasonable to visit an urgent care center first. However, if you are uncertain, it is always best to err on the side of caution and visit the ER if you think you might have a true emergency medical condition. Aspen Medical Center here in Santa Fe and Aspen Urgent Care in Espanola, New Mexico provide urgent care services seven days a week. Aspen Medical Center is certified by the Urgent Care Association of America. We have x-ray and laboratory services on site. Our commitment to compassionate and convenient patient care ensure that patients with urgent medical needs receive the best medical expertise days, nights, weekends and most holidays. According the Nature Conservancy, “More than 95 percent of New Mexico has experienced mean temperature increases over the last 30 years.” July is generally the hottest month of the year in Santa Fe with average daily high temperatures of 86°F. At this time of year, the risks of heat-related illnesses, such as heat exhaustion and heatstroke, are increased. What are heat exhaustion and heatstroke? Heat exhaustion occurs when your body gets too hot. If heat exhaustion goes untreated, it can lead to heatstroke. This happens when your internal body temperature reaches at least 104°F. Heatstroke is much more serious than heat exhaustion. Heatstroke can lead to shock, organ failure, or brain damage. In extreme cases, you can die from heatstroke. What are the symptoms of heat exhaustion? The symptoms of heat exhaustion include muscle cramps, heavy sweating, pale or cool skin, weakness and/or confusion, dizziness, headache, nausea +/- vomiting, rapid heart rate, and dark-colored urine which is indicative of dehydration. What are the symptoms of heatstroke? In addition to the symptoms of heat exhaustion listed above (with the exception of heavy sweating and pale or cold skin), warning signs of heatstroke include fever with a temperature of 104°F or higher, red or flushed skin, lack of sweating, trouble breathing or shortness of breath, fainting, and seizures. How does a person get heat exhaustion or heatstroke? Heat-related illnesses occur when a person is not able to keep him or herself cool. The main causes of heat exhaustion and heatstroke are hot weather and exercise. Your risk of heat-related illnesses is increased by prolonged exposure to high temperatures. How can we prevent or avoid heat-related illnesses? During hot weather, it is important to try to keep cool. This is especially true for babies, children, and the elderly who are more sensitive to the heat. If you are ill, overweight/obese, or have heart disease, you are also at greater risk. People who work outside or in hot settings are also at greater risk of heat exhaustion or heatstroke. What do you do if you or someone you know has heat exhaustion or heatstroke? If you suspect you are getting too hot, get out of the sun/heat into a cooler environment even if it is just into the shade. Lie down and elevate your legs to improve blood flow to the brain. Take off any heavy or tight-fitting clothing if possible. Apply cool wet towels to the skin or take a cool bath to help cool your body temperature. Drink fluids (water or a sports drink). Take frequent sips; do not guzzle. Avoid caffeine or alcohol. If someone is displaying the signs and symptoms of heat exhaustion or heatstroke listed above, take their temperature. If the temperature is 104°F or more, call 911 and seek medical help immediately. If after trying to help someone cool down, symptoms do not improve or temperature is 102°F or higher after 30 minutes of treatment, call 911. If the person faints or has seizures, call 911. If the person stops breathing, call 911 and start CPR. Just remember to stay hydrated and do your best to keep cool this summer! Most people will not make it through life without suffering from back pain at some point in time. Back pain can occur in different areas of the back, but low back pain is particularly common. More than 30% of U.S. adults report having had low back pain within the previous three months. Most episodes of back pain will improve within 6 weeks or less, but some people develop chronic low back pain (low back pain lasting more than three months). There are many different potential causes of low back pain but it can generally be prevented by learning how to improve your posture as well as proper techniques for lifting and exercising. What causes low back pain? A muscle strain or spasm, sprains of ligaments (which attach bone to bone), joint problems or a “slipped disk” can all cause low back pain. A common cause of low back pain is using your back muscles in activities you’re not used to, such as lifting heavy furniture or doing yard work. Unexpected events such as falling or a being involved in a car accident can also cause low back pain. A slipped (also called a herniated) disk happens when a disk between the vertebrae (or bones of the spine) bulges and presses on a nerve coming out of the spinal cord. Sometimes people who have a slipped disk don’t know what caused it or sometimes it comes from an activity such as lifting while twisting. Most of the time, slipped disks and other low back pain can be relieved by following a few simple methods. Back pain can generally be treated with over-the-counter medications such as acetaminophen (Tylenol) or ibuprofen (Advil). Gentle stretches or exercises such as yoga can be helpful as well. Using a heating pad for 20 or 30 minutes can help with painful muscle spasms. Ice packs and massage can also be helpful. Weight loss is another way to help improve low back pain over time. For chronic low back pain, acupuncture has been shown to be a helpful treatment. Multiple studies have shown acupuncture provides significant pain relief in people with chronic low back pain. The Joint Commission, an independent non-profit organization that accredits and certifies 21,000 health care organizations and programs in the United States, recommends acupuncture as an treatment option for pain management. We offer low-cost acupuncture at Aspen Wellness (https://aspenwellness.care, phone: 505-466-5887). Often multiple or ongoing treatments are necessary to improve and maintain some level of pain relief. Acupunctureis a safe and healthy alternative to other treatments like narcotic painkillers which have multiple risks but are sometimes used for chronic low back pain. I recently had the pleasure and privilege of working again with Himalayan HealthCare (HHC), www.himalayanhealthcare.org. 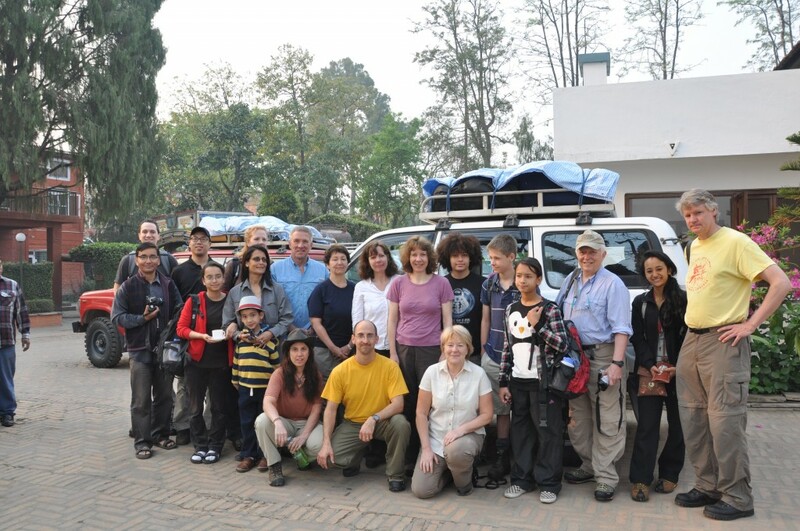 HHC is a non-profit organization that has been working in Nepal for 25 years now. Their mission as stated on their website is “to create sustainable development programs in the remote areas of Nepal that will improve the quality of life for its people. 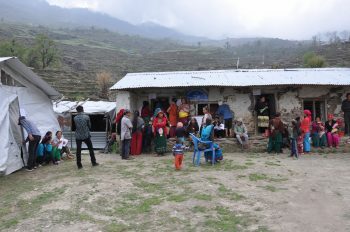 Himalayan HealthCare achieves its mission by providing primary healthcare, community education, and income generation programs that enable people to be self-supporting in the long-term.” Founder, Anil Parajuli, and his wife Soni, and their wonderful family, are inspirational and a joy to work with. My wife, Rachel, an acupuncturist, and our son and I were part of a team of seven international volunteers on the recent Spring 2017 Medical Service Trek. 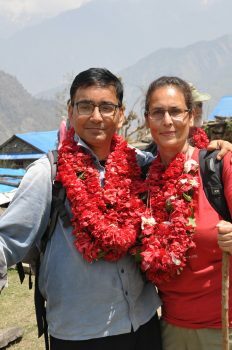 There was also a Nepali doctor, Dr. Trishna Chand Thakur, on the trek. 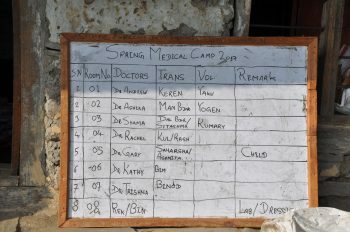 The trek lasted for twelve days and we trekked to two villages, Shertung, and Lapa, and set up clinics there for a total of 5 days, treating hundreds of patients. or made uninhabitable by the earthquake. After the earthquake, there were multiple aftershocks as well, one of which killed at least another 200 people. There was an estimated $10 billion in damage done by the earthquake which is about 50% of Nepal’s nominal GDP. Needless to say, this has had an enormousimpact on the people of Nepal and two years later, recovery is still underway. On our trek, we treated patients with a range of medical problems, everything from hypertension and back pain to congestive heart failure and seizures. People were very appreciative and kind. I was struck by the resiliency, joy, and strength of these people who live in very remote mountainous areas. If you are looking for a charity to contribute to, I strongly encourage you donate to Himalayan HealthCare. Or if you are in the medical or dental fields, please consider joining a trek while they are still happening. HHC qualifies as a 501(c)(3) organization so donations are tax deductible. I can guarantee you that your money will be put to good use, as I have witnessed their work myself. 1. Wash your hands. It is very important to wash your hands frequently. Wet your hands, use soap to create a lather, and then rub your hands together for at least 20 seconds; then rinse and dry. Be sure to lather the backs of your hands, between your fingers, and under your fingernails. This is one of the best ways to prevent the spread of germs and decrease your chances of getting sick. 2. Get regular exercise. It is important to get regular exercise to help your body stay healthy and to maintain a strong immune system. The Department of Health and Human Services recommends aerobic exercise. 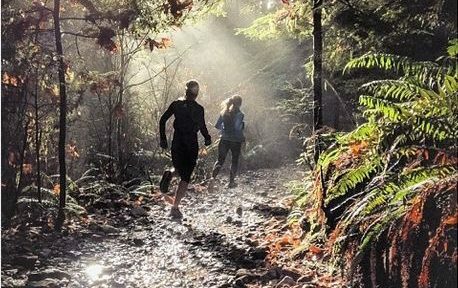 Most healthy adults should get 150 minutes a week of moderate exercise or 75 minutes of vigorous exercise a week, or a combination of the two. Exercise helps the body function more efficiently and helps the immune system fight off potential illnesses. 3. Drink water. Our bodies are more than 50% water. In order to stay healthy, it is important to keep hydrated. Drink plenty of water everyday. One common recommendation, the “8×8 rule,” is to drink 8 eight-ounce glasses of water a day. 4. Get adequate sleep. If you want to stay healthy, it is important to get adequate sleep every night. When you don’t get enough rest and get “run down,” it can weaken your immune system and make you more susceptible to illness. Adults vary in how much sleep they need, but most of us need 7 to 9 hours a night. Children and adolescents need more sleep. 5. Get your flu shot. The Centers for Disease Control and Prevention (the CDC) recommends that everyone 6 months and older get the flu shot every year, ideally before the end of October. However, getting the flu shot later in the season is okay too. 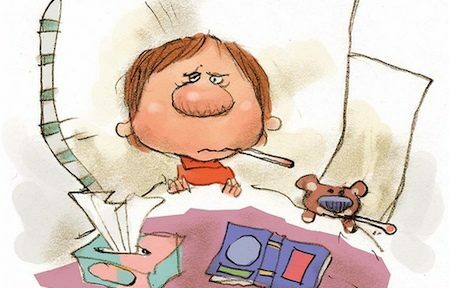 In New Mexico, the flu season can last until May. The flu shot helps decrease your risk of getting the flu. It will also protect your loved ones from exposure to the flu. At Aspen Medical Center, we offer flu shots every year. 6. Eat healthy. In order to maintain an optimally functioning immune system, it is also important to eat a healthy diet. There are many different dietary recommendations out there, but a good rule of thumb is to avoid junk food (sodas, chips, candy, pre-packaged food and fast food), and eat a variety of fruits and vegetables, in addition to whole grains, and healthy fats (e.g olive oil) and protein (eggs, fish, legumes, nuts, and lean meats). 7. Minimize your stress level. The immune system can be affected by stress. Some stress is inevitable, but intense prolonged stress can lead to sickness. It is important to find healthy means of coping with stress such as relaxation or calming exercises. Prayer, meditation, journaling, or talking with friends, family, or a counselor are all ways to help deal with stress. Acupuncture and massage also help alleviate the negative affects of stress. If you have anxiety, depression, or other condition that interferes with your normal functioning, then seek out a mental health practitioner or medical provider. Skin cancer is the most common form of cancer in the United States, with more than 3.5 million cases being diagnosed annually. According to the Skin Care Foundation, one in five Americans will be diagnosed with skin cancer at some point in their lives. The most common form of skin cancer is basal cell carcinoma, followed by squamous cell carcinoma. Malignant melanoma is less common but more deadly. The incidence of melanoma appears to be increasing with an estimated 76,690 new cases in 2013. There are other less common types of skin cancer as well. The most important risk factor for the three types of skin cancer mentioned above is sunlight which is a source of ultraviolet radiation. There is ultraviolet A (UVA) and ultraviolet B (UVB) radiation. Both types of UV radiation can damage the skin and lead to wrinkles, skin cancer, and other skin problems. Other risk factors for skin cancer include severe blistering sunburns, lifetime sun exposure, and tanning. 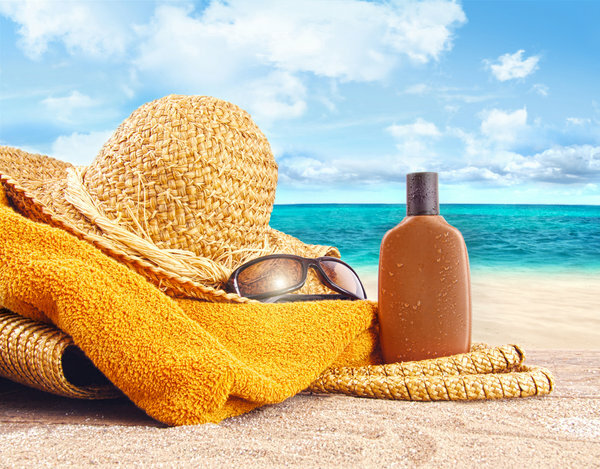 Being in the sun too often and for too long can lead to skin cancer even if you don’t burn. So, how do we prevent skin cancer? The best way to prevent skin cancer is to protect yourself from the sun. Try to avoid outdoor activities between 10am and 4pm when the sun’s rays are the strongest. If you have to be outside, seek shade. And remember that clouds and water don’t protect you. Sixty to 80% of the sun’s rays go through clouds and can reach swimmers at least one foot below the surface of the water. Come join us THIS SATURDAY (4/6) for our Grand Opening Event! Aspen Medical Center is dedicated to serving the Santa Fe community with top-notch Urgent Care and Primary Care as well as ensuring a great time at this Grand Opening Event! Be sure to get you and your friends here early to get your name in the hat for the gift certificate drawing! In March and April of 2012, I had the pleasure of working with Himalayan Healthcare. 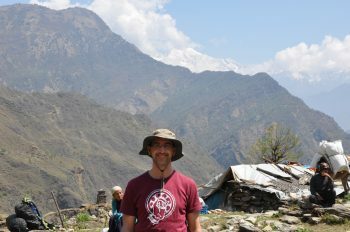 They are an amazing non-profit organization helping poor villagers in the mountains of Nepal since 1992. 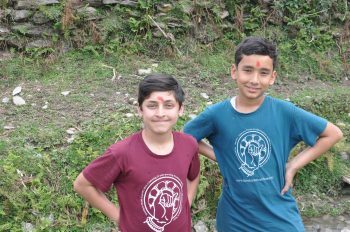 Co-founded by Anil Parajuli, they provide medical care, education, and income generating opportunities to the rural people of Nepal. Twice a year, they lead volunteer medical treks into the beautiful mountains of the Ganesh Himal. Our trek lasted ten days and we trekked through snow, rain, mud, fog, and over two mountain passes, the highest of which was 13,000 feet above sea level. We visited two remote villages along the way where we planted trees, met with villagers, and set up medical clinics where we treated hundreds of people with otherwise little or no regular access to healthcare. It was an awesome experience. The people were incredibly hospitable and appreciative, the scenery was incredible, and I made friendships that I hope will last a lifetime. Description: Join Himalayan Healthcare for a special screening of Hearts in the Himalayas. This award-winning documentary showcases their volunteer work over a two year period providing medical care to rural villagers in the mountainous regions of Nepal. Caring For The World Films announced today its film Hearts In The Himalayas has won a prestigious Award of Merit in the Women Filmmaker category from the Best Shorts Competition. The award was given for director Debi Lang’s compelling humanitarian documentary Hearts In The Himalayas which profiles the extraordinary work of Nepalese NGO Himalayan HealthCare, a driven and dedicated volunteer organization that provides medical care, education, and income generation opportunities to the people of rural Nepal.